Save time! 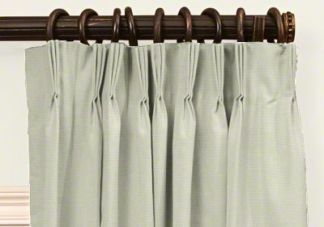 Our Quick-Ship Pleated Drapes ship in 5-10 business days! Our quick-ship pleated drapes provide custom elegance and sophistication for many applications. Choose from hundreds of indoor and outdoor fabrics to best suit your needs. Pleated drapes are hand-pleated, pre-pinned and ready for installation. Graze Length: The drapery panel hangs just at the floor. Trouser Length: Add 1"-3" to your Drapery Length so that the panel spills slightly onto the floor. Trouser is not recommended for functional drapery panels. Puddle Length: Add 4"-12" to your Drapery Length so that the panel "puddles" on the floor. Puddling is not recommended for functional drapery panels. Vinyl-covered, lead-free drapery weights are used in the bottom of our drapery hems to provide control of drapery panel corners after installation. Drapery panels have a better hanging quality when weighted at the bottom corners. Custom orders are NON RETURNABLE and CANNOT BE CANCELLED once placed due to the custom and made-to-order processes involved. Any problems or concerns with custom-made products must be reported within 5 business days of receipt. Our workmanship is guaranteed within 6 months of receipt of your custom-made product. Please contact customer service with your concerns. At Drapes Curtains N More, customer satisfaction is a measure of how products and services supplied by our company meet or surpass your expectations. Through our testimonies, our satisfied customers speak for themselves. Every day we strive to ensure that all of our customer needs and expectations are met. We want to establish and maintain a relationship that is built on QUALITY products and service that Drapes Curtains N More provides to both commercial and residential clients worldwide. Why Drapes Curtains N More? site signifies that you are in agreement with our terms and conditions If you contact us, please reference number .